Painting of a king cobra on a visitor train in Dusit Zoo, Bangkok. 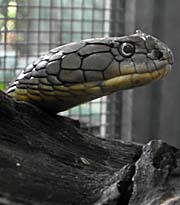 The King cobra, the largest poisonous snake in the world (size up to six meters), appears in large parts of South and Southeast Asia. It's mostly living in forests (near waterplaces) and on the ground, but can appear also in open grassland, mangrove swamps, palm oil or rubber plantations and other agricultural used areas. They avoid entering settlements. The big animal can swim and climb up trees. Some authors describe the king cobra as nocturnal, but I have seen at least two of them active in daytime, one of them crossing a road. King cobras are not aggressive and avoid contact to humans, but they defend their nests and eggs decicively. 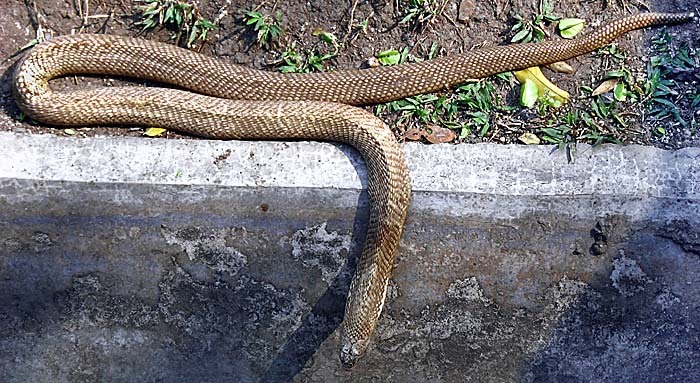 If people come to close to their nests, the king cobra erects, spreads out it's neck and gives a fizzing noise. Best to disappear immediately, otherwise they bite and that could easily end lethal. Erected, the snake reaches an impressive height of 1 meter to 1.50 meters. This particular species is the only snake, which builds nests on the ground. It covers the nest with leaves and other soft plant material. Such a nest can reach a height up to 1 meter. The poisonous teeth are unlike to those of vipers fixed in their mouth and are up to one centimeter long. The poison is middle poisonous, but often deadly due to the amount of poison injected into the victims body (in the average the amount of two tea spoons). 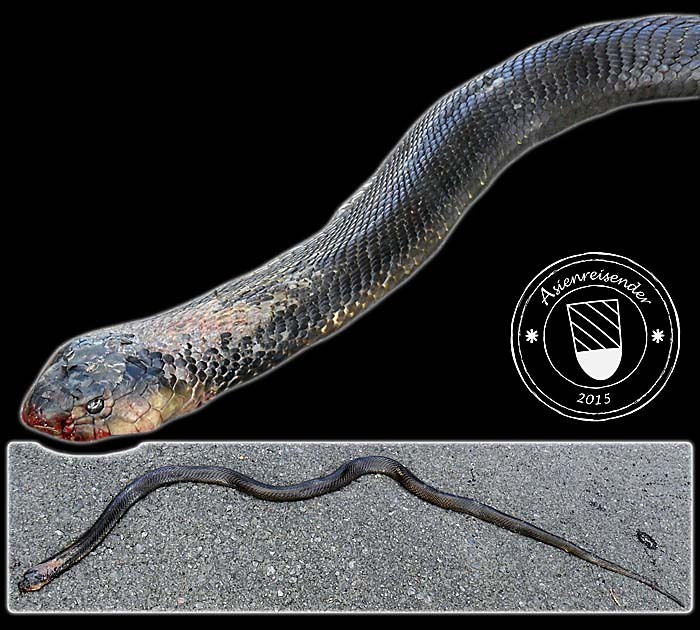 The huge destruction of tropical rainforests made the king cobra a rare, even endagered species. It's also hunted for it's skin, which can be processed to hand bags and such stuff. Indian snake charmers like to keep king cobras and present them in their shows. Roads are the spot one can see most of the many snake species. Because roads cut their habitats in pieces, that they are forced to cross them. At that moment they are visible and vulnerable. Many get killed then by cars. Locals kill them if they can do so without danger. Well, since buildings are quite open here and offer many opportunities for animals of all kind to enter, people don't want to see appearing snakes in their homes. But king cobras are so large that barely somebody dare to come close to them and kill them with a machete or approaching it with a stick. King cobras hunt other snakes and eat them. Here and there they eat lizards as well, but they prefare smaller to middle-big snakes.